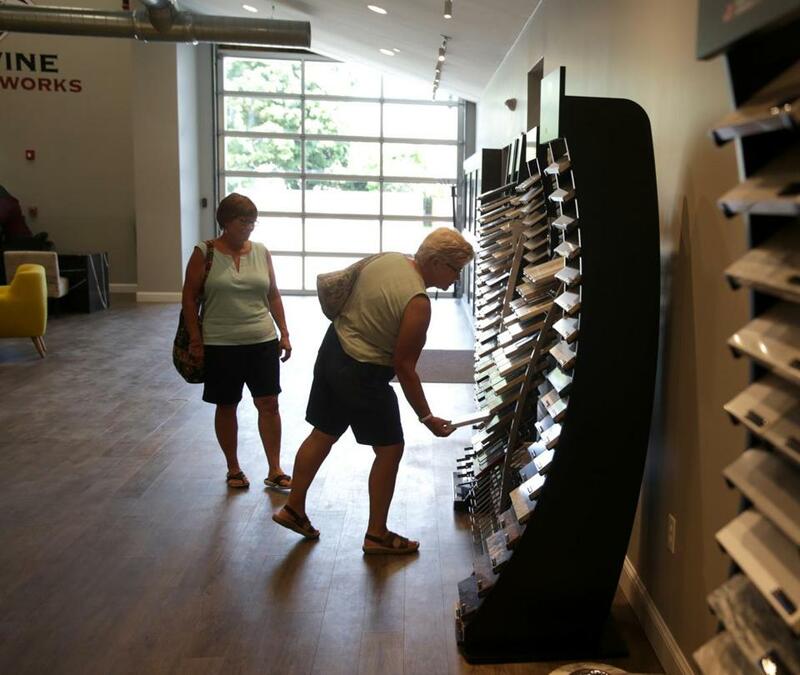 Shoppers visit Divine Stoneworks at MetroWest Design Center in Ashland. For years, Ashland has been trying to revive its downtown, not an easy task given the growing dominance of web commerce and the vagaries of the economy. But this year, two homegrown efforts have come to fruition. One is the Corner Spot, a community gathering place and incubator for pop-up businesses that occupies a corner lot on Cherry Street near Town Hall that was once anchored by an old, abandoned house. The other is the MetroWest Design Center, a gleaming showplace filled with high-end home improvement businesses and other companies in what had been a vacant factory at 60 Pleasant Street. It didn’t take long for Beth Reynolds, who was hired 18 months ago as Ashland’s first economic development director, to see the possibilities in the Cherry Street lot near her office. 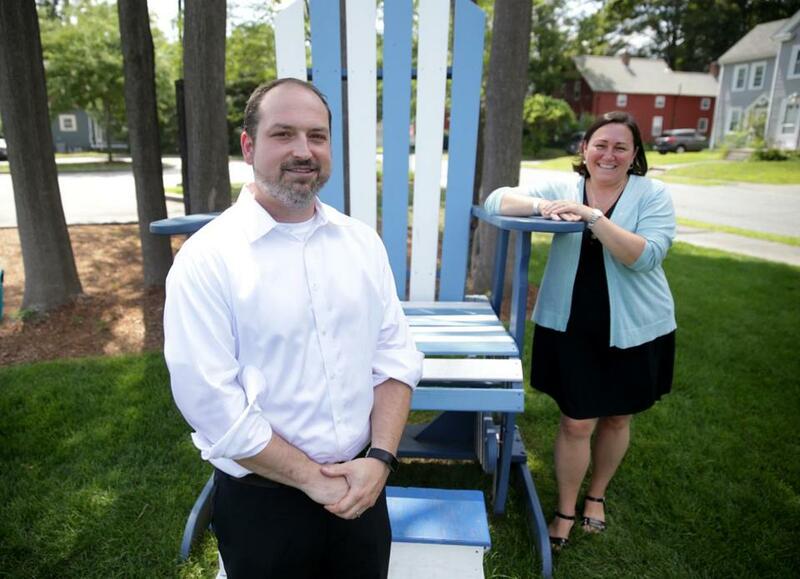 “I just knew this spot had some potential,” said the 43-year-old Maine native who went to college to be a teacher but landed in the hospitality industry before becoming director of membership development and outreach for the MetroWest Chamber of Commerce. Town Manager Michael Herbert and Ashland’s economic development director Beth Reynolds at the Corner Spot. Town residents quickly warmed to Reynolds. And there was plenty of support when she organized a committee to raise money to launch the Corner Spot project. Through an online crowdfunding tool the group raised $38,000 in five weeks, qualifying for a state grant that matched the first $25,000. Afterwards, others throughout the community — town employees, local officials, business owners, and residents — pitched in. 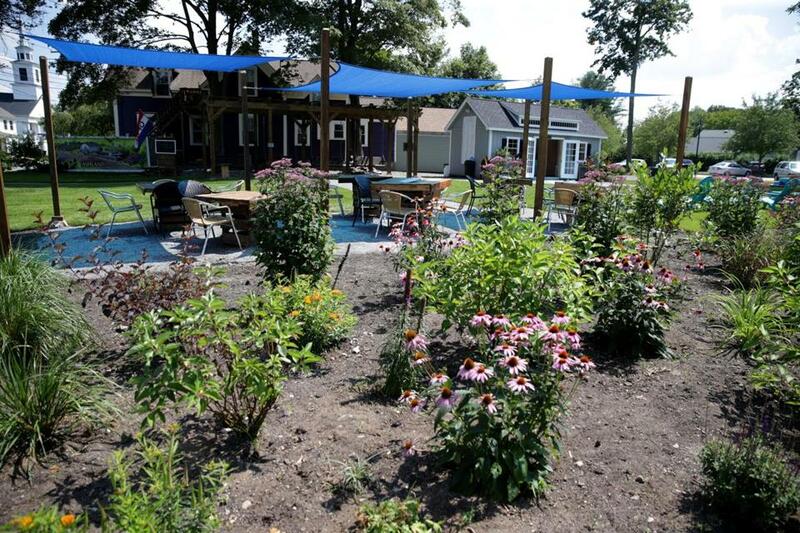 In late June, 300 people attended the grand opening, milling on the grass, smelling the flowers blooming around the perimeter, and enjoying the bench swings, set up under a pergola that had been hand-stained by the town manager and his daughter. It was deja vu a few weeks later on a steamy August evening, when roughly 300 people — including tenants, contractors, and members of several area business and industry groups — packed the MetroWest Design Center for a summer social hosted by the Ashland Business Association. John Dudley Jr., who lives in town with his family, purchased the former shoe mill in 2014, gutted the 70,000-square-foot space, and built a complex of retail, office, and industrial spaces now occupied by 14 companies. They include Divine Stoneworks, Marra Flooring, JD Millworks, and Dudley’s own United Home Experts. The space is also home to the Nokona Athletic Club and the offices of the local Connect Community Church. 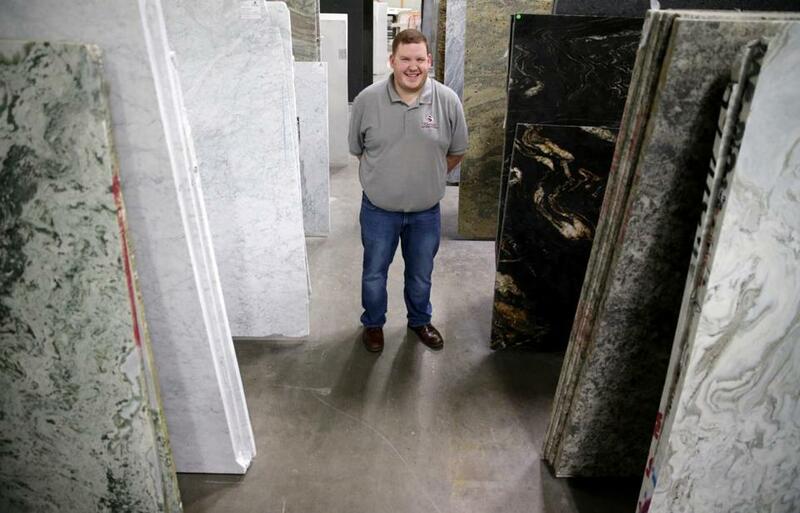 Dakota Lotz works in business development for Divine Stoneworks at the MetroWest Design Center. By contrast, the Corner Spot features a shed with shiplap walls, a handicapped-accessible restroom, a kitchen, and a wide swath of retail space. Outside, wooden tables are arranged under bright blue sail shades, turquoise plastic Adirondack chairs sit on the grass, and a pile of tires, painted in primary colors and stacked for climbing, add to the welcome and charm. Pop-ups are invited to set up shop for one to six weeks to sell their products — everything from coffee and barbecue to home decor, jewelry, art, gifts, and more. Among the first businesses to test the waters were the Coffee Trike, a mobile coffee service; Firefly’s BBQ; and Sweet Home Handmade, a curated collection of home decor, jewelry, and gifts. Town officials say they hope some pop-ups will do well enough to consider setting up in a bricks-and-mortar space downtown, following the path of Julie Gross, who for years sold her zucchini breads at the local farmer’s market and now runs a wholesale bakery on Main Street, Julie’s Z Breads. They share a similar optimism for the economic stimulus they see the design center bringing. But while these ventures are the most visible evidence of Ashland’s downtown renaissance, they represent a small part of the changes underway in this town of 16,500. At Town Meeting in May, voters approved spending $580,000 for a downtown River Walk, a $1.2 million project funded by a combination of local tax dollars and state grants. Future projects to complete downtown revitalization could cost between $5 million and $10 million, said Michael Herbert, the town manager. “I think everybody is rolling in the same direction,” said Carl Hakansson, 63, who grew up in Ashland and now chairs the Board of Selectmen. Herbert said the linchpin of the downtown’s revival is private investment, and others agreed. Nadine Nesbitt lives next to the Corner Spot. 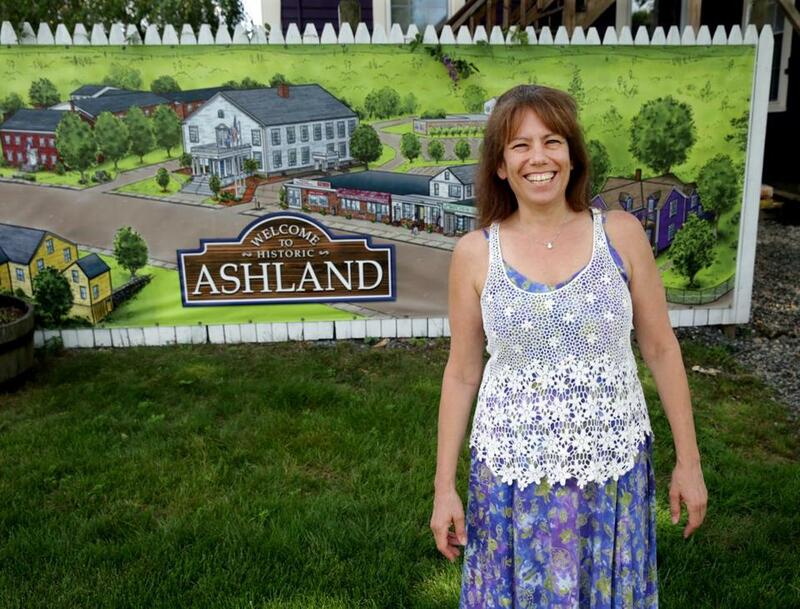 Nadine Nesbitt, 56, moved to Ashland in 1985, ran an insurance agency for years, and last year started WAITT (We’re All In This Together), a marketing company that connects Ashland businesses to the community with a structured giving program. Alex Carleton, past president of the 120-member Ashland Business Association and operator of Acumentri, a business coaching and services company on Main Street, talks about creating a business culture that factors in relationships and loyalty. Longtime residents like Hakansson, and Cliff Wilson, president of the Ashland Historical Society, share the view that among a downtown’s greatest assets — and predictors of its success — are the things that don’t come with price tags. Both remember the days before the town became a bedroom community, when Warren Telechron Co., which manufactured electric clocks, employed thousands, and residents and small-business owners in town were on a first-name basis. And both believe a version of the old days could happen again. “It was a great community to grow up in. . . . and I want future generations to have that experience,” said Hakansson, who remembers when a trip downtown, on foot or by bicycle, might include a visit to Nate the Barber or Phil the Cobbler and a stop at Beans for penny candy or a dish of ice cream. “I’d love to have people working in Ashland again,” Wilson said. The Corner Spot in Ashland is a gathering place and an incubator for pop-up businesses.